The ethereal, 4000ft Kalalau Lookout stands up to the ocean, sun and winds with brave, severe beauty and offers one of Hawaii’s most remarkable and moving vistas. Hope for a clear day for ideal views of Kalalau Valley, but know that even a rainy day can make for settling clouds that could later disappear – followed by powerful waterfalls and, of course, rainbows. For the full experience, venture beyond the lookout at the end of the road and follow the dirt track along the sheer rim of the canyon to the Pihea Lookout at the far side. Of all the scenic drives in Hawaii, this is the big kahuna. The Hana Hwy snakes down into jungly valleys, up towering razor-edge cliffs, over 54 one-lane bridges, past nearly as many waterfalls, and around 600 twists and turns along the way. Get out and stretch your legs at several aptly placed lookouts, or hike into fragrant forests, short paths lead to Eden-like swimming holes, side roads wind down to sleepy seaside villages (mention several lookouts, too). If you’ve never tried smoked breadfruit, taken a dip in a spring-fed cave or gazed upon an ancient Hawaiian temple, set the alarm early – you’ve got a big day coming up. This scenic overview, the highlight of Pala‘au State Park, offers a stunning view of the Kalaupapa Peninsula from the edge of a 1600ft cliff. The best light for photography is usually from late morning to mid-afternoon. It’s easy to get the lay of the land from the lookout; you’ll get a good feel for just how far you’ll travel should you descend the trail. Interpretive plaques identify significant landmarks below and explain Kalaupapa’s history. The dormant Kauhako Crater, visible from the overlook, contains a little lake that’s more than 800ft deep. At 400ft, the crater is the highest point on the Kalaupapa Peninsula. The windy summit of Waikiki’s signature backdrop affords fantastic 360-degree views of the southeast coast to Koko Head and west to the Wai‘anae Range. A lighthouse, coral reefs and surfers waiting to catch a wave are visible below. Although it’s a fairly steep 0.8-mile hike to the top, the all-ages trail is fully paved. Sunrise here is worth getting up at 4am. Dawn’s ever-changing interplay of sun, shadow and clouds creates a mesmerizing dance of light and color on the crater floor. The most popular viewing spot is the Visitor Center, on the rim of the crater (9745ft), a half-mile below the actual summit. Alternatively, leave the early-morning crowds behind by taking the 10-minute hike up Pa Ka‘oao (White Hill), which begins at the east side of the visitor center and provides stunning crater views. Finally, perched atop Pu‘u‘ula‘ula, Maui’s highest point, the summit building provides a killer panorama from its wraparound windows. On a clear day you can see the Big Island, Lana‘i, Moloka‘i and even O‘ahu. Brief natural and cultural history talks are given at the summit at 9:30am, 11:15am and 12:30pm. Motor around the entire gaping maw of the Kilauea caldera on this 11-mile route, popping out for ganders at steam vents and lookout over the smoking crater. Hikes into and around the caldera and through lava tubes are also possible. For the best views, start at the park’s visitor center and drive counterclockwise. Gaping, rainbow-walled chasms, dramatic skyscapes and gushing waterfalls are yours for the viewing via myriad lookouts in this state park. At 0.3 miles north of the 10-mile marker, and an elevation of 3400ft, is the Waimea Canyon Lookout – the most scenic of the lot. The 800ft Waipo‘o Falls can be seen from a couple of small, unmarked lookouts before the 12-mile marker, and then from a lookout opposite the picnic area shortly before the 13-mile marker. Pu‘u Hinahina Lookout at 3640ft, offers two lookouts near the parking lot at a marked turnoff between the 13- and 14-mile markers; in a few short steps from the parking lot, it gives you the illusion of being in the forest overlooking the canyon floor. Overlooking the back of Waimea Canyon, this lookout is also a good vantage point for the valley floor, with panoramic views to the ocean. At all lookouts, sunny days following rain are ideal for prime views. Hop in a 4WD, jump on a mountain bike or lace up your hiking boots for this 12-mile exhilarating adventure that rewards with sweeping views of everything Lana‘i has to offer. For the best views, get an early start. The trail looks down on deep ravines cutting across the east flank of the mountain, and passes Lana‘ihale (3370ft), Lana‘i’s highest point. On a clear day, you can see all the inhabited Hawaiian Islands (except for distant Kaua‘i and Ni‘ihau) along the route. Don’t forget the binoculars. Not that you’ll need them to see the 40-ton humpbacks that breach right off this cliffside perch jutting into the western edge of Ma‘alaea Bay. And the sunsets here are spectacular, too. Papawai Point is midway between the 8- and 9-mile markers. Note that the road sign reads simply ‘scenic point,’ not the full name, but there’s a turning lane into it, so slow down and you won’t miss it. It is breathless and breathtaking up here in the rarefied air of Hawai‘i’s most sacred and lofty spot, with the setting sun bouncing halos off the surrounding cinder cones. Look for the mountain shadow framing Hilo in a purple triangle when it’s clear. When it’s cloudy, the view is just as spectacular, only different; it’s like looking down on heaven, so thick is the layer of marshmallow fluff blanketing the island. Southward, massive Mauna Loa looms. Once the sun goes down and the stars come out, the best big Island view transitions to the best view in the universe. Follow the tour buses to this ridge-top lookout for a sweeping vista of windward O‘ahu from 1200ft. Straight ahead is Kane‘ohe, Kailua’s to the right, and hat-shaped Mokoli‘i Island and the coastal fishpond at Kualoa Regional Park lie to the far left. A section of abandoned highway winds down from the right side of the lookout, ending at a barrier near the current highway about 1 mile away. It’s worth walking even just five minutes down the trail for a photo of the magnificent views looking back up at the snaggle-toothed Ko‘olau Range and out across the valley. For visual drama, this road is every bit the equal of Crater Rim Dr. As you descend toward the sea, panoramic coastal vistas open before you, revealing slopes covered in frozen fingers of blackened lava. Then, at the coast, you get to stare at those same flows from below, looking up to where they crested the cliffs and plunged across the land to meet the sea. Early morning and late afternoon are the best times to photograph this unique landscape, when sunlight slants off the lava. At 3600ft, Waikolu Lookout provides a breathtaking view into the steep Waikolu Valley and out to the ocean beyond. After rains, the white strands of numerous waterfalls accent the sheer cliffs and fill the valley with a dull roar. Morning is best for clear views, but if it’s foggy, have a snack at the picnic bench and see if it clears. True to its name, the 53-mile Saddle Rd (Hwy 200) runs along a saddle-shaped valley between the island’s two highest points, Mauna Kea and Mauna Loa. It’s an extremely scenic drive: sunrise and sunset bathe these majestic, cinder cone–studded mountains in a gentle glow, and on clear days the vistas extend forever (at least to Maui). For a remarkable panoramic view across Honolulu, detour to this tiny park, 2.5 miles up Round Top Dr from Makiki St. It’s half a mile in to the lookout; bear to the left when the road forks. The sweeping views extend from Diamond Head on the far left, across Waikiki and downtown Honolulu, to the Wai‘anae Range on the right. To the southeast is the University of Hawai‘i at Manoa, easily recognized by its sports stadium; to the southwest you can see clearly into the green mound of Punchbowl crater. The airport is visible on the coast, with Pearl Harbor beyond that. It’s not just about soaring tropic birds, but sweeping ocean views that include the possibility of an occasional whale breaching in the distance. Even just overlooking the bluffs from the cul-de-sac fronting the lighthouse is worth it. Redfooted boobies, wedge-tailed shearwaters, red-tailed and white-tailed tropic birds and Laysan albatross are among the birds you could see, or Kaua‘i’s nene, the endangered Hawaiian goose. Look for sea turtles and spinner dolphins in spring and summer, and for humpback whales in winter. You’ll also see Moku‘ae‘ae Island, which is teeming with protected wildlife. The Akoni Pule Hwy ends at this vantage point into a stunning row of steep, mystical cliffs. This ancient valley is utterly memorable and enshrouds the diversity of the Big Island landscape in twilight shades and thick mists. You have to hop in a boat to experience the crown jewel that is the Na Pali Coast. From ocean level, be humbled by these monstrous yet velvety cliffs, as spinner dolphins, honu (sea turtles) and whales (in winter) come along for the ride. Early morning trips are usually easier on the stomach. This switchback road (Hwy 44) heads north from Lana‘i City into cool upland hills where fog drifts above grassy pastures. As the road gently slopes down to the coast, the scenery is punctuated by peculiar rock formations sitting atop the eroded red earth, similar to those at Garden of the Gods. Further along, you’ll spot the namesake WWII shipwreck as you approach Shipwreck Beach, a beachcomber’s dream. Take in views of farmland that’s been cultivated for more than 1000 years, the broad brushstroke of valley, river and taro, plus a smattering of rare wildlife. Park across from the Princeville Center so you don’t have to cross the busy street. Want to experience the Hawaiian Islands in all of their lush, sandy glory? 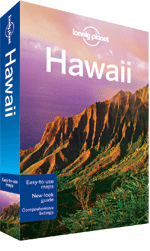 Check out Lonely Planet’s Hawaii travel guide and our range of island-specific guides.